← The weekly roundup is back. You’re welcome. A voice wakes us before 5. Where’s my teddy? Where’s my teddy? We all wake bleary eyed and husbandface stumbles out of bed to deal with the small voice and his freshly woken brother. I turn over, toss about and eventually switch on the light. I dive into the end of Bruce Springsteen’s Born to Run and read with tears falling at a wise heartfelt man, honest about his flaws and deeply in love with his family. We stumble through the morning with aching bodies and caffeine fuelled brains. Eventually it is time for church. As we sing songs of God’s presence and love in desert times the tears fall once more. 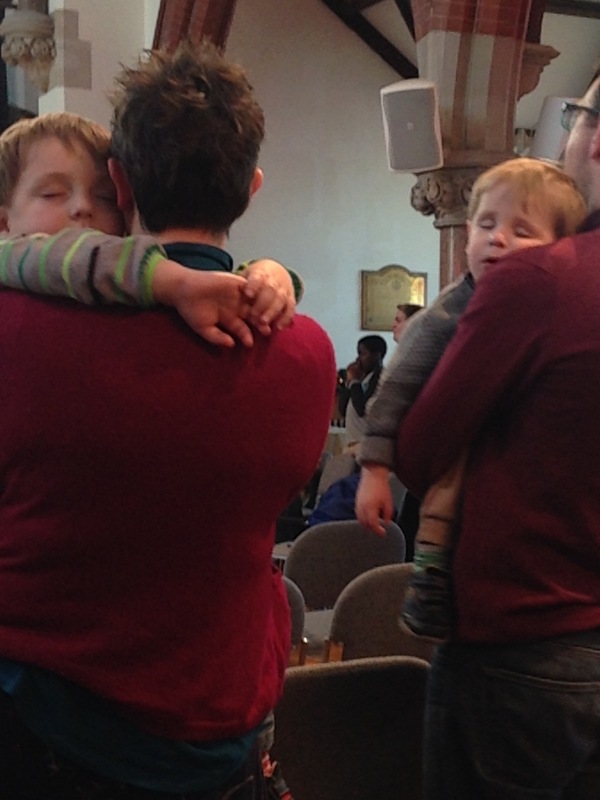 Two boys rest tired in parents arms and with swaying singing fall asleep on our shoulders. My arms ache. My heart is full of these small creatures who have stolen so much and yet increased us in so many ways. I long to rest my tired weary head on a warm chest and fall asleep. As I sway with the eldest in my arms I sense the presence of the One who holds me. Tears well again. I am so tired. I am so empty. I lean in and imagine myself as held and loved as this boy in my arms. I am loved. I am loved. It is Sunday. We are at the end of ourselves. We are held. We drive off to friends who are family for lunch. We laugh at small boys. We eat roast chicken. We snooze on sofas and we return to church for some chaotic Christingle joy. Son1 belts out My Lighthouse loud and shouty and I want to shout it with him. ‘You will lead us through the storm.’ We sing Joy to the World at a gallop and I feel hope stirring. We hysterically laugh at small boys trying to burn the church down with candles in hands and we hear these words in the chaos. God is love. We are loved. God is love. We are loved. God is love. We are loved. God is love. We are loved. Driving home we point at all the Christmas lights and the boys squeal for joy. Pasta and bed. Fish finger sandwiches for us as we wearily stare at each other unable to communicate through tired eyes and hearts. We sleep. Small boys disturb us all night but we sleep. We are held. We are loved. We are led on in the storm.